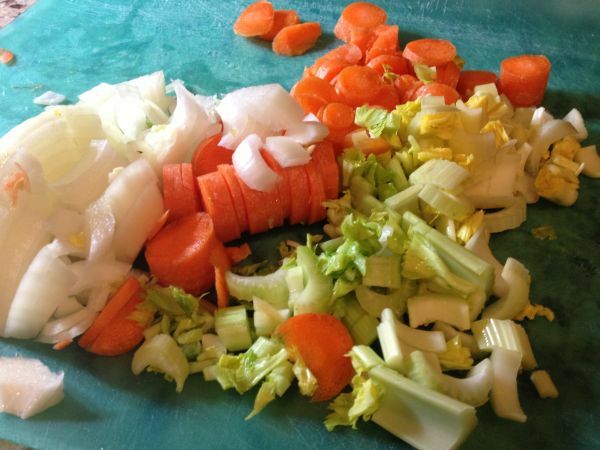 I was having all the kids over recently for Sunday dinner and was looking for something “different” from the items I had on hand in the freezer. 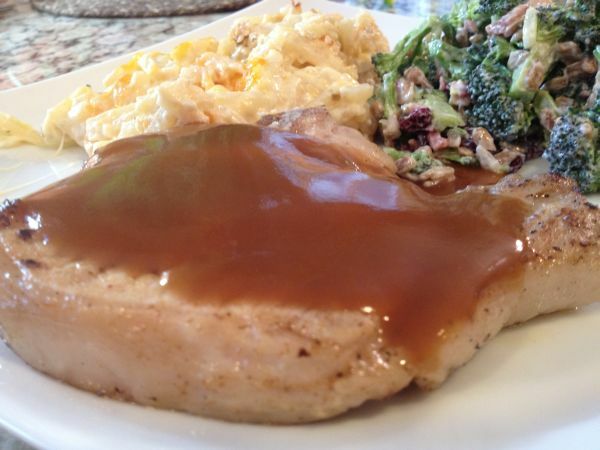 I had recently picked up some nice bone-in pork chops at Costco, so I sent off a text to Nick, learning that chops are one of his favorites! I had also just previewed a segment on Diners Drive-in’s and Dives where pork chops had been prepared and thought that they sounded great! 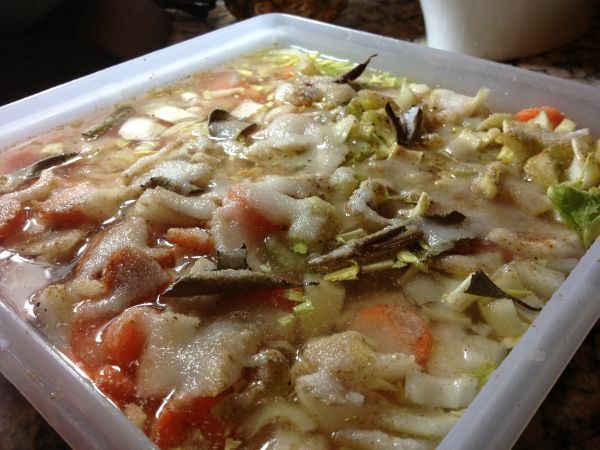 I decided to brine them because brining any meat can add a significant amount of moisture to it before you cook it, making it juicier and more tender! 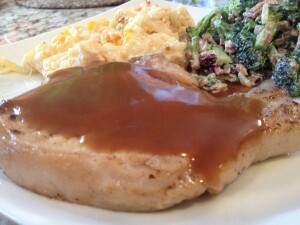 I prepared these chops in the oven because it was really cold outside, but I would recommend grilling them if you can! 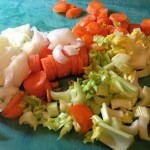 To make the brine combine all of the ingredients and stir. 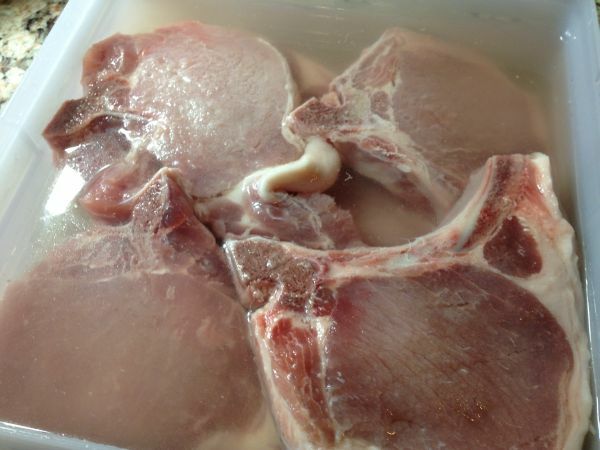 submerge the pork chops in the brine and refrigerate for at least 18 hours and up to three days. 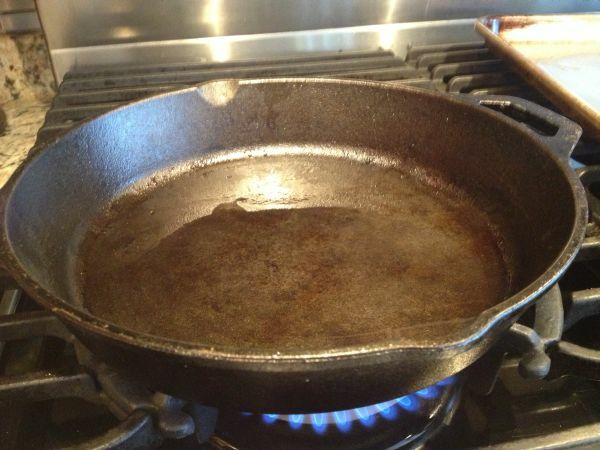 I learned this basic technique from Ann Burrell, of Food Network and I’ve found that mixing the ingredients within your storage container works just fine too. Simply stagger the chops in a seal-able dish, cover with water and sprinkle each of the other ingredients on and around them. Cover and shake well. Turn and toss a couple of times throughout the brining process. 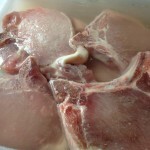 After the allotted time, let chops and brine to come to room temperature and then remove the chops and discard the brine. Rinse off chops quickly with cold water. 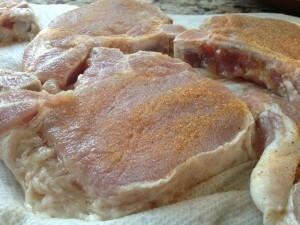 Pat them dry with paper towels and Sprinkle seasoning mix. 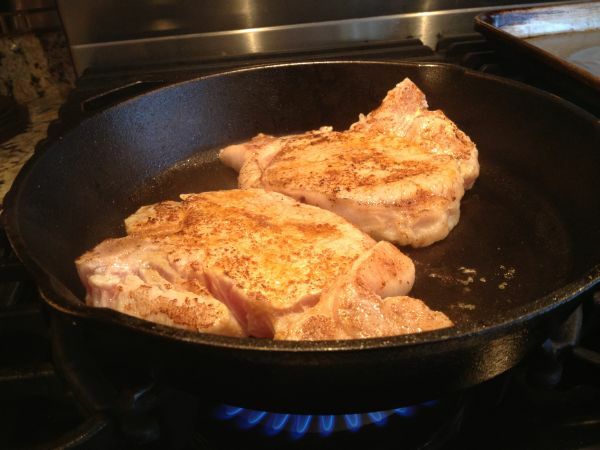 Sear chops in cast iron pan quickly on each side and then place them on a baking sheet or pan. Or just grill them outside on a hot grill! 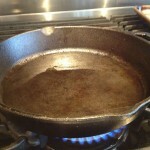 If cooking indoors, stand them up so the fat edge is in contact with the hot pan to crisp up the fat edge. Bake the chops covered with foil for 10 minutes then turn them over baking uncovered for another 10 minutes until the internal temperature is around 150 degrees. 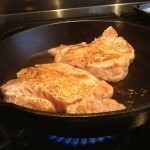 The chops will continue to cook once you have removed them from the oven (or grill) covered with foil. Allow them to rest for five to ten minutes in a warm place before serving. The meat should be cooked medium for very juicy chops. 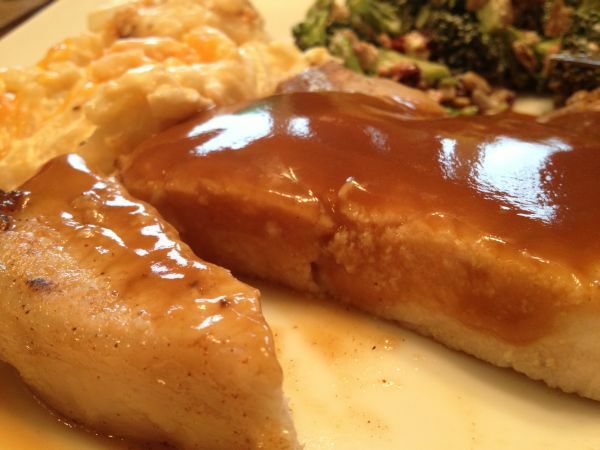 I served them with a nice pork gravy along side of cheesy hash browns and a broccoli salad, but some of my gang prefers barbecue sauce!